SELECTED firefighters will be trained to render immediate medical assistance in emergencies, under a new scheme to equip some of them with dual roles in addition to firefighting and rescue. As they are usually the first to arrive on the scene, firefighters trained as emergency medical technicians (EMT) will be able to apply medical aid such as cardiopulmonary resuscitation (CPR), bleeding control and the removal of airway obstruction until paramedics arrive. Currently, firefighters possess basic first-aid skills. Deputy Prime Minister Teo Chee Hean called the EMT scheme a "potential game-changer" in how the Singapore Civil Defence Force (SCDF) maximises the potential of officers and deploys resources in a tighter labour market. In his keynote address yesterday at the SCDF Workplan Seminar 2013 at ITE College East, Mr Teo, who is also Home Affairs Minister, listed an increasing demand for emergency services and a manpower crunch among upcoming challenges for the force. He said the SCDF had "done well in the past year", recording 0.02 fire fatality for every 100,000 people in the population, the lowest among major cities such as Hong Kong, Tokyo, New York and London. "This is largely due to a robust fire safety framework, implemented consistently by dedicated and well-trained professionals, and also well-supported by the community," said Mr Teo. The emergency medical technician scheme will begin next month with an eight-week training programme at the Civil Defence Academy in Jalan Bahar for 10 to 20 firefighters. Officers will be selected through criteria such as meeting physical requirements, and via recommendations by commanders at their stations. Lieutenant-Colonel Ng Yih Yng, chief medical officer of SCDF, told The Straits Times firefighters with such medical skills "will change the outcome for patients" in emergency situations. Eventually, each of the 18 stations will have a team of firefighters who are EMT-trained. 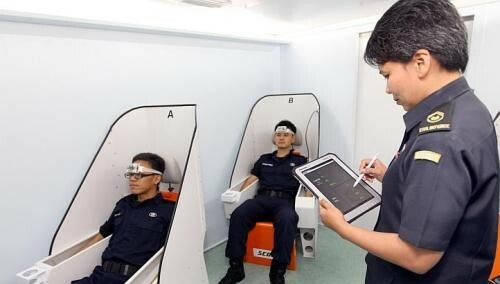 As part of its ongoing capability development, the SCDF has also increased the use of training simulators to give officers a realistic and challenging, yet safe environment for training. SCDF Commissioner Eric Yap also introduced a Responders' Performance Module, a mobile unit that can be set up at sites of major or prolonged operations to give firefighters a place to recharge and recuperate. A prototype of the module, which will be introduced this year, was on display yesterday. It contains an interior fitted with air-conditioning and equipment to monitor vital signs, among other things, to reduce the body temperatures of firefighters after they have had long exposure to heat and fire. An external area will also help in rapid cooling. On emergency medical response situations over the past year, Mr Yap said fire bikers have been trained in the use of, and are equipped with, automated external defibrillators to deal with cardiac arrest cases. From April last year to March this year, the defibrillators were used in 217 cases and 34 patients were successfully revived.